In March 2016, I got it in my head that we (my husband and I) needed to purchase a home in San Francisco. We were spending roughly $45k in rent per year, and I intuitively knew that we were leaving money on the table by not owning property in SF. I talked to coworkers about their home buying experiences, did some reading online and attended open houses on weekends. One of the first steps I took was to research local real estate agents on Yelp. After filtering through pages of listings and reviews, I reached out to a few agents. One of them responded lightning fast, and we ended up meeting her the next day. She was extremely professional and showed us that she was willing to listen to our needs and work with us through the purchase process. We talked about home types, neighborhoods, price range and pre-approval limit. She then drove us around town and we looked at 4 - 5 open houses that day with our agent. Towards the end, she said hey one of my colleagues is showing this apartment, it's a little bigger than what you're looking for, but it might be worth checking out. We said, sure, why not! Well, it was love at first sight. Gorgeous walnut floors, open and airy kitchen + living room, bonus den/dining room, 3 bedrooms + 2 bathrooms. One of the bathrooms is big enough to be a bedroom by SF standards. Mr. FH and I discussed the day's adventures over dinner that evening. We consulted our "requirements list" for a new home, and I said, hey - it looks like this last condo apartment we saw is checking off every box in the list. Well, everything except skylights. We had of course read a thousand times that you simply don't make an offer on the first house you see. But we rationalized to ourselves by saying hey this is San Francisco - if you snooze, you lose. In such a hot real estate market, people do crazy things like make a cash offer for a $1+ million house on the spot. Our agent informed us that there were a couple more offers coming, but at $50k over asking price, the seller was ready to give us the place without waiting for the other offers. We definitely wanted to avoid a bidding war, so we went with our agent's recommendation and made the offer. Once our offer was accepted, everything else happened like clockwork. Our agent recommended a mortgage broker, and we started working with them on getting our paperwork ready. Two months later, we had keys in our hand! During this home purchase process, I saw for the first time in my life how a major financial decision can get completely derailed by emotions. Especially for a self-proclaimed logical person. As a retrospective, I want to share are all the ways I allowed my emotions cloud my judgment. These are applicable to any high-pressure decision making situation, from job interviews to salary negotiation to watching a stock portfolio tank during a market crash. At the time, the majority of our $200k savings was not invested in anything. Since I had not seen any returns on this money in the past, I failed to properly evaluate the opportunity cost of a down payment. I let my excitement over a new home take over, and all the math we did during this purchase was heavily biased towards potential upside. Of course, San Francisco's real estate market was at an all-time high, and many people had doubled/tripled their investments in just a few years. What I would do differently: Assume a 7% return on down payment and factor that in as a cost of the home purchase. This is a conservative estimate of what that money could have otherwise earned us if invested in index funds. I approached the interview from a perspective of "I'm new to this, please help!" This immediately put the real estate agent in the position of power, and she was driving the conversation from the get-go. We went with the first agent we met. She was an amazing executor and helped us navigate the purchase process without a glitch. She was also extremely nice and I didn't want to be rude by asking for client references or time to interview other agents. 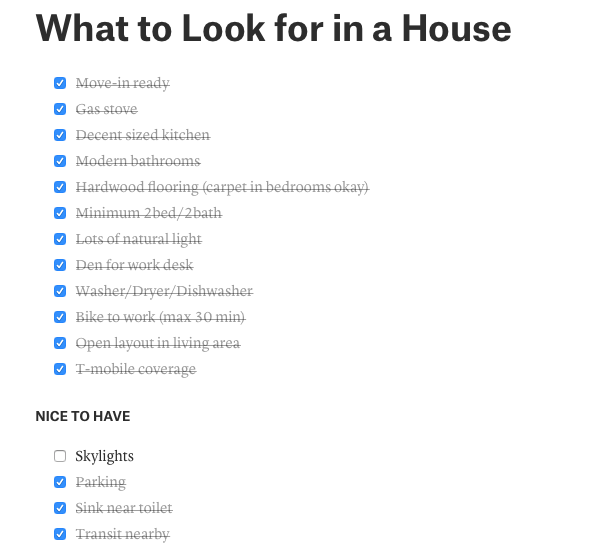 What I would do differently: Create a checklist of questions to ask the real estate agent. Ask about neighborhoods they specialize in, recent purchases/sales they facilitated, their understanding of the market, how many active listings they currently have. Definitely ask for references from recent clients. Find out the pricing terms, and negotiate a buyer's agent discount ahead of time. We came to the open house in a car and drove around the neighborhood on a quiet Sunday afternoon. We didn't spend nearly enough time walking around the neighborhood streets, walking/biking to the nearest grocery store, checking out local cafes and restaurants. We live a car-free life, so we should've spent more time getting to know the neighborhood as a pedestrian. We were both working full-time jobs at the time, and felt like we had no time to really walk around the neighborhood. I had a false sense of urgency around this process. All the houses we were seeing had multiple buyers interested in it, and I felt like we had to move fast to lock in a place we liked. What I would do differently: The best way to know a neighborhood is to actually live in it. Renting is a great way to "try before you buy." If a 12-month lease is not feasible, find a short-term Airbnb rental for a month. Visiting a neighborhood for a few hours and actually living there are completely different. In our working lives, we commute twice a day, five times a week. When making our wishlist for a new home, we said "30 minute bike commute radius" because we had done that commute previously. Hey, this is San Francisco! A 30 minute bike ride on flat ground is hugely different from a 30 minute bike ride involving some hills. When driving around the neighborhood in a car, it's so easy to miss the small hills but these can be thigh pinchers when on a bike, especially when you have to do it 10 times a week with no real recovery time in between. Without doing full due diligence, it's so easy to underestimate the day-to-day difficulties that could arise in the future. What I would do differently: Try before buying. At least for a week, do the same commute you are about to sign up for, prior to sealing the deal. We approached this from the lens of "make an offer that will get accepted." When you're house hunting, your excitement, awe, happiness, warm fuzzy feelings of a new home -- all of your emotions conspire against your better judgment. So much that you forget the game you're playing. You don't win this game by closing on a house. You win by purchasing a house that is a great value for the money you're investing in it. We did our due diligence and understood the prices in the real estate market. We looked at recent sales in the neighborhood, and analyzed the price per square foot in those transactions. We looked at units of similar sizes as well as larger/smaller houses to get an idea of the range we were dealing with. We thought it was okay to make an offer right at the market rate. We were thinking that this game is won by making an offer that is likely to get accepted. In reality, as a buyer, we should be making an offer that reflects the highest value for money. The first offer we make should be a lowball offer, and it's okay if it gets rejected. There are plenty of properties that will come up for sale, and you don't have to close on the first deal you look at. What I would do differently: Making the offer is the single most important part of the home purchase process. Take a step back, and approach this from a standpoint of maximizing the value for money on the investment. The game is not won by getting your first offer accepted. In fact, what I would do in the future is to view multiple homes with no rush to buy, make several low-ball offers to test the market, then make each offer a learning opportunity to get a feel for how sensitive the market is to your offer. Remember what I said about our real estate agent being an excellent executor? Well, she was! As soon as we had our offer accepted, she helped gave us a referral for a mortgage broker and made an email introduction. Naïvely, we kicked off the mortgage application process with this first broker we talked to, and started collecting all the documents we needed. The mortgage process was incredibly detailed, and even more tricky for us since we're Canadians living in the USA. The sheer amount of paperwork required got me feeling very overwhelmed with the process and I allowed myself to get consumed by the details in the process. When looking at the terms of a mortgage, i.e. down payment, mortgage term (5 year vs 10 year vs 30 year), fixed vs. variable interest rate, points, mortgage insurance, etc., it is 100% important to model out the total cost of the mortgage over the term of the loan. Get interest rate quotes from multiple lenders! The interest you pay on a home loan is probably one of the biggest expenses in your life. Why in the world would you not shop around for the best deal? It sounds obvious right? Well, emotions were back at play here. When you're stressed about the 50 different documents you need to provide for your mortgage application, your brain shuts off anything that would require going through the process another time, for a different lender. What I would do differently: Get pre-approval and mortgage term quotes from multiple places. Banks, mortgage brokers, recommendations from realtors, recommendations from friends — the more quotes you have, the more negotiating leverage you wield. We built a mortgage cost calculator spreadsheet to compute the total amount of interest paid over the term of the loan. Compare this total cost across multiple quotes, negotiate (and negotiate some more), and then decide on the best mortgage terms. Pit each mortgage lender against the other and demand an even lower interest rate. Don't take what's given to you, because in this industry, you've got to fend for yourself. 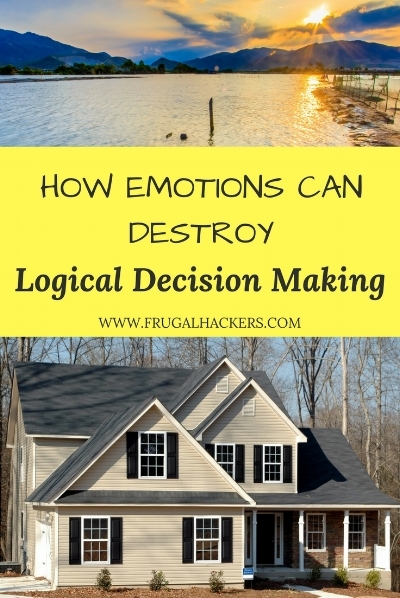 Emotions will impact decisions, and they can result in costly mistakes if you don't build checks and balances in your decision making process. Don't just go with the flow. Stop to think about why you are doing what you're doing. Think about the best strategies to apply to maximize your objectives. Ask for help. Talk to friends and family members who have experienced similar things before. Read, read, read. Ask questions, find answers, and then read some more. Reading the experiences of other people who have gone through the same process (not unlike this post) is a excellent way to not repeat the same mistakes. As the famous quote by Sun Tzu goes, every battle is won or lost before it is ever fought. Therefore, being extra prepared and vigilant can't possibly hurt your case. Did you find this post useful? Share on Pinterest by pinning this photo!